The forecast for the afternoon was dodgy (chance of thunderstorms) and Andrea's ankle was still a bit sore from banging it last weekend. So we opted for a hike nearby in the Jura with plenty of options to turn around along the way. We started in Grellingen (just like last weekend) and headed up to the Eggflue. Up, up, initially through town and then gently under the woods until we hit the Eggflue itself. After a bit of enjoying the view (camera batteries dead, doh! ), we continue along the ridge to the Blattepass, then up to the ridge of the Blaueberg itself. Now we follow the nicely shaded ridge for a while until finding a good lunch spot (shade, bench, view!) pretty close to the high point of the ridge. 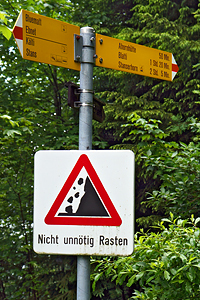 After lunch it's onward, past the Blauepass, past the Mätzlerchrüz and then along, slightly descending to the Challpass. From here we more or less have to go to Kleinlützel, if only because of the name. :-) The rest of the way is a pleasant mix of forest path and forest road, leading us along the ridge and down, down into town. We have a bit of time before the bus, and there's a convenient restaurant close to the bus stop, so we get to spoil ourselves with cool beverages before starting the trip home. Distance: 18.6 km, 697m up, 593m down.